All season long, the Maroons played even with the best teams in the nation, going 5–4 against ranked teams in the regular season. During the playoffs, they continued to be competitive against the highest caliber teams—unfortunately, that wasn’t enough. The South Siders couldn’t keep up with Trine on Friday, dropping a 6–1 decision. After securing their second win of the postseason against sixth-seeded Denison (28–19) in a tense 1–0 pitchers duel, the breaks went the other way against host Alma (31–13), as Chicago (26–11) lost to the third-seeded Scots 3–1. The Maroons certainly proved that they belonged, finishing with a .500 record in the postseason as they justified their seeding by finishing fourth in their region. They had previously won their first game, a 3–2 triumph over John Carroll. Trine went ahead 1–0 on Carly Searles’ third-inning RBI-triple. Fourth-year Sarah Neuhaus (8–5) came off for third-year Kim Cygan in the fourth inning, but was brought right back after Cygan allowed a homerun, a double, and a walk. Neuhaus contained the damage, allowing only the inherited runner to score. The Maroons got their only run in the fourth, as Cygan scored on a Vicky Tomaka single. Even in the loss, though, the Maroons got both of their first-year hurlers—Emily Ashbridge and Tabbetha Bohac—valuable time on the mound. The pair held Trine scoreless for the last two and two-thirds frames. “We’re not fearful of Trine,” Kmak said earlier in the week. Cygan (16–5) redeemed herself on Saturday as she hurled a six-hit shutout against Denison, extinguishing threat after threat, as the Big Red managed runners on base in five out of the seven innings. In the second inning, Denison had runners on second and third after a wild pitch by Cygan, but with two outs, Denison’s designated hitter Gretchen Staubach popped the ball right back to Cygan, who made the catch to end the inning. Fourth-year Julia Schneider plated the only run of the game in the top of the fourth, doubling off of Denison’s Becca Dyer to lead off and advancing to third on a groundout by fourth-year Liz Payonk. First-year Raechel Cloud’s sacrifice fly brought Schneider home. Denison threatened to retaliate in the bottom of the inning, as Cygan faced Staubach again with two runners on and two outs. Cygan proved up to the challenge once again, striking her out swinging to preserve the lead. After an error, wild pitch, and walk, Denison mounted the game’s final offensive threat in the seventh inning, with runners on second and third with two outs. Almost predictably, though, Cygan managed the threat, inducing a routine groundout that Schneider sent to Payonk at first for the game’s final out. “We know that if we play our game the way we can we can beat any team,” second-year Vicky Tomaka said last week. True to form, the Maroons got their record-tying 26th win of the season behind strong pitching, aggressive baserunning, and reliable defense. A slow start against Alma, though, put the Maroons in what proved to be an insurmountable hole. In the top of the first inning, a pair of errors by Chicago’s middle infield allowed the Scots to get two runs on their two hits. 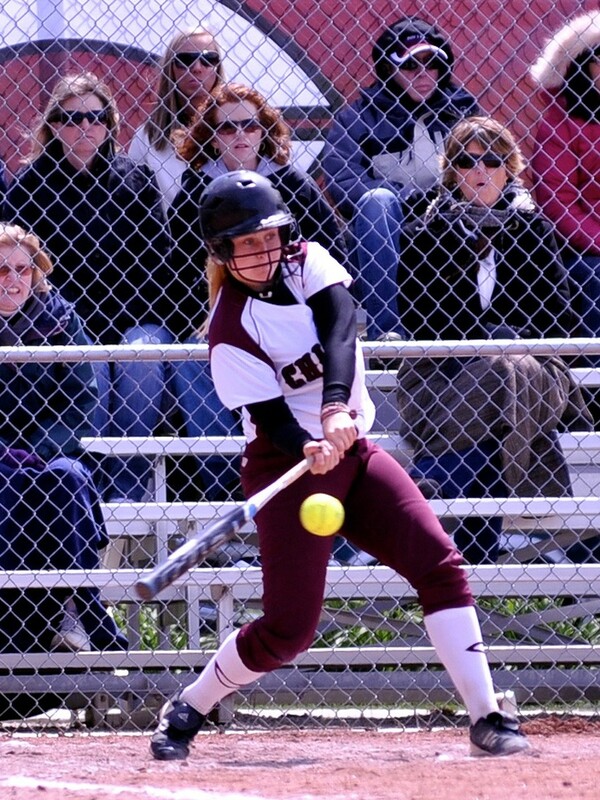 Cygan proved dominant once again throughout the game, allowing only five more hits and a sole run in the seventh, but Alma’s Louise Rezmer was equally fit for the occasion, holding the Maroons to four hits and an unearned run. Second-year Kaitlyn Carpenter got her 57th hit of the season against Alma—one short of Chicago’s single season record—coming around to score in the sixth on an error to reduce the deficit to one. The seventh inning started promisingly, with a double by Cloud, but three straight outs sent the Maroons back to Hyde Park. While at Alma, though, the South Siders impressed, placing five onto the all-Region team. Carpenter and Cygan made the first team, and catcher Zoe Oliver-Gray, Schneider, and Payonk made the third team.